Formerly referred to as “child prostitution,” the term CSEC represents a national shift within law enforcement and judicial agencies, identifying children as victims rather than perpetrators of a crime. St. Anne’s President and CEO Tony Walker shared a tragic statistic: up to 80% of victims of CSEC are current or former foster youth. Already vulnerable because of a lack of family ties and stability, many children in the child welfare system are being targeted, systematically abused and forced into modern-day slavery. Some residents at St. Anne’s have either been victims of CSEC or are being actively recruited. Walker shared St. Anne’s frontline efforts—from comprehensive all-staff training to a close partnership with the local LAPD division—in order to combat CSEC. 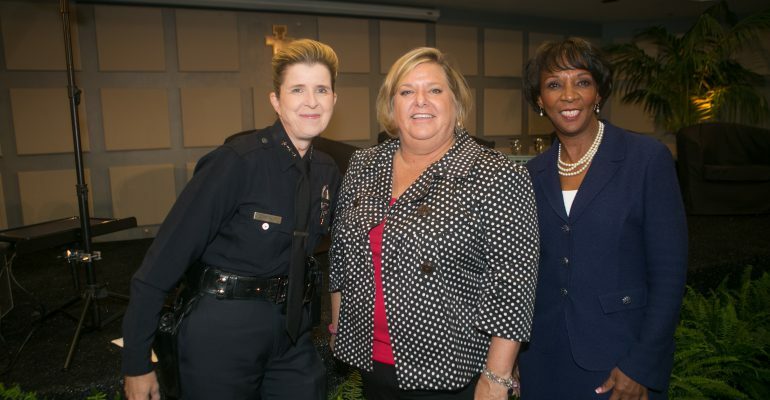 Val Zavala, veteran journalist and vice president of Public Affairs at KCET led an in-depth discussion with the Summit panelists: Los Angeles District Attorney Jackie Lacey, Superior Court Judge Catherine Pratt and LAPD Assistant Chief Beatrice Girmala. Chief Girmala shared her department’s efforts in training officers to identify the signs of CSEC victimization. Judge Pratt discussed her leadership in the STAR (Succeeding Through Achievement and Resilience) Court, a collaborative, victim- centered court that provides services to minors who have been commercially sexually exploited and are on probation for prostitution or related charges. District Attorney Lacey discussed her office’s efforts in helping victims gain a pathway to getting CSEC-related criminal records cleared. All panelists agreed that St. Anne’s comprehensive services are crucial to helping victims of CSEC, providing a safe place to live and a path to a different, better future.